National Caramel Day is April 5th. 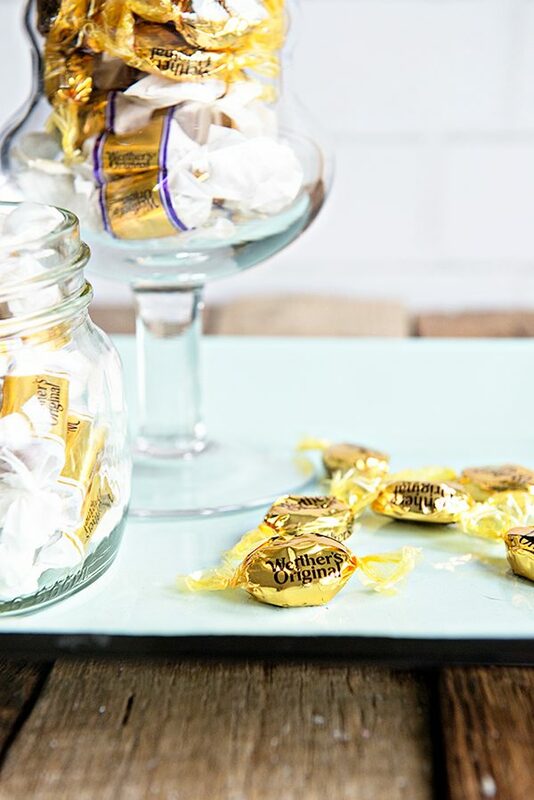 Join Werther’s Original as we solve the “Great Caramel Debate” and enter for the chance to win a supply of Werther’s Original candy! Friends, during my more than 10 years of blogging, it is this moment that were my Grandpa still alive he’d say I hit the big time! I’ve partnered with Werther’s Original to help solve the “Great Caramel Debate”. 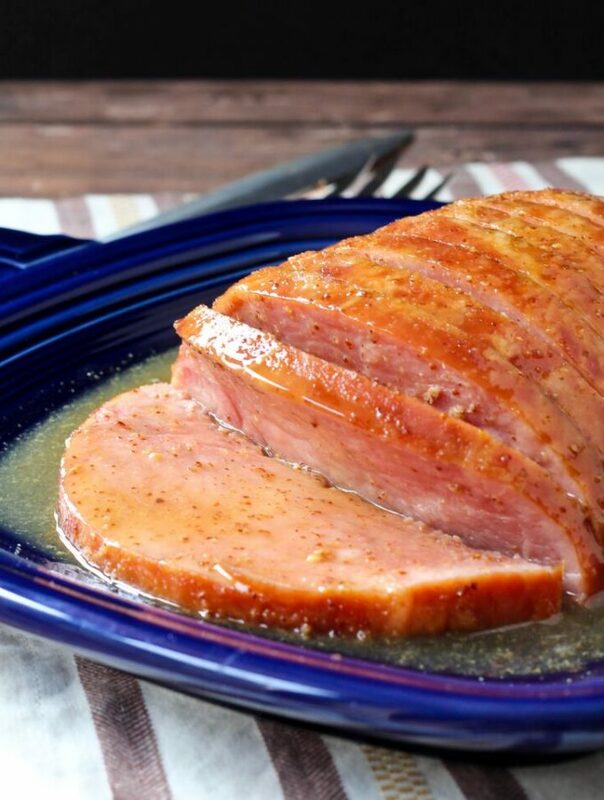 National Caramel Day is April 5th and we want to know…is it “Kar-muhl or “Ker-uh-muhl” to you? Before we get into the debate, let me tell you a little story about my Grandpa Hudiburg. He had the most amazing farmhouse and a constant stash of rare Werther’s Original candy hidden in a very special place in his house. He once shared his secret place with me – inside his big butlers pantry off his kitchen. 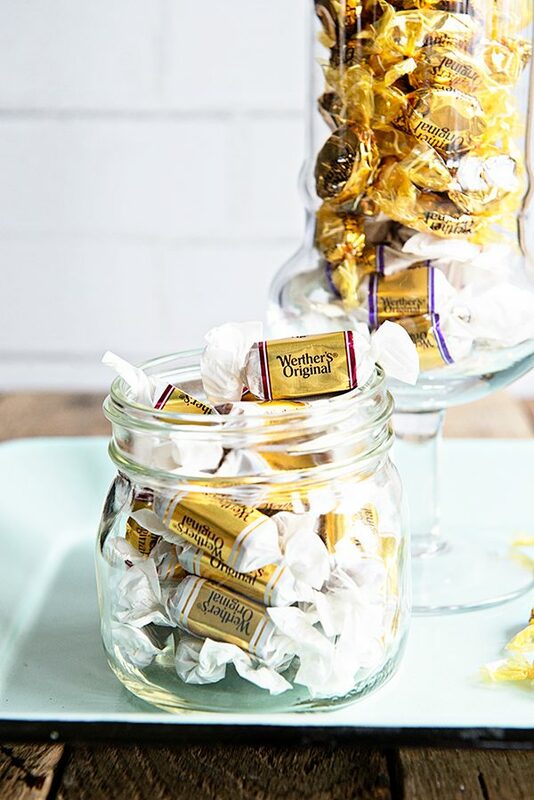 As a young girl, as soon as we’d get to Grandpa’s house I’d sneak away from the rest of my family, head into the pantry, climb up on the step stool, then the countertop and reach into a glass bowl to grab a Werther’s Original candy. Of course, I thought my grandpa favorited me because he shared his special hiding spot. Little did I know, my siblings and all my cousins were privy to the hiding spot as well. We just all assumed the others didn’t know! To this day I can’t have a Werther’s Original without thinking of my Grandpa Hudiburg. Naturally, as a lover of Werther’s Original, I couldn’t let National Caramel Day go by without taking part in the “Great Caramel Debate”. Werther’s Original is asking Americans whether they pronounce the sweet treat Ker-uh-muhl or Kar-muhl to end the debate once and for all! When the debate is finalized, the town of Carmel, Indiana will celebrate by changing their name to Caramel for the National Caramel Day celebration on April 5th. If you are lucky enough to live in or near Carmel, Indiana, you can join in on the National Caramel Day fun. Events will include fun and games, caramel treats and plenty of prizes, including a one-year supply of Werther’s Original plus a Carmel, Indiana prize package for the person who guesses how many caramels are in a giant bowl on display. I’m thinking April 5th might need to be a road trip day to Caramel, Indiana! I decided it wasn’t fair for Carmel, Indiana to have all the caramel fun! 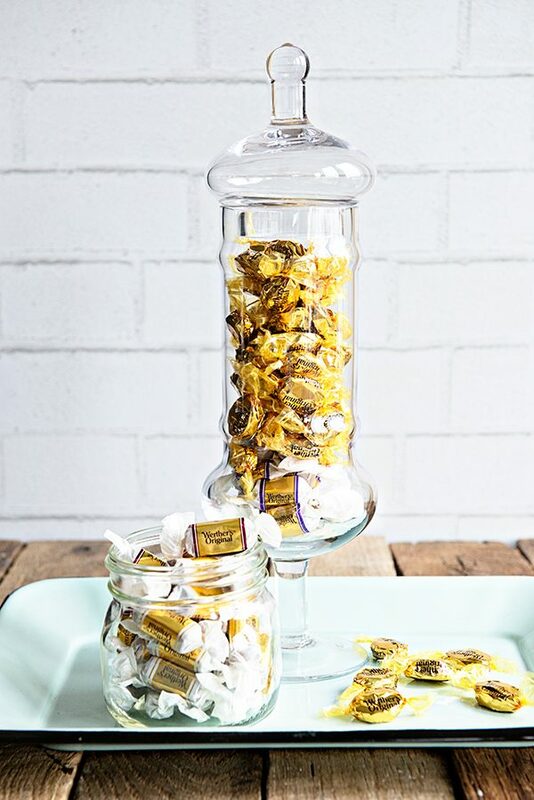 I’m going to give one lucky Dine & Dish reader 2 34-ounce bags of Werther’s Original Hard Candy. All you have to do to enter is leave a comment here on Dine & Dish telling me if you pronounce Caramel Kar-muhl or Ker-uh-muhl . In additional, let me know where you’re from because I’m curious if it could be narrowed down by where we all are geographically and how we pronounce caramel. Leave your comment on this post by midnight on Friday, April 7th. Winner will be chosen at random and notified via a valid email address the next day. For those who are curious, for me it’s Kar-muhl all the way but I think that’s a midwest thing. Ker-uh-muhl seems like a fancy way to say it. Either way these sweet treats are pronounced, there is no debate needed around the fact that Werther’s Original are amazing and delicious! 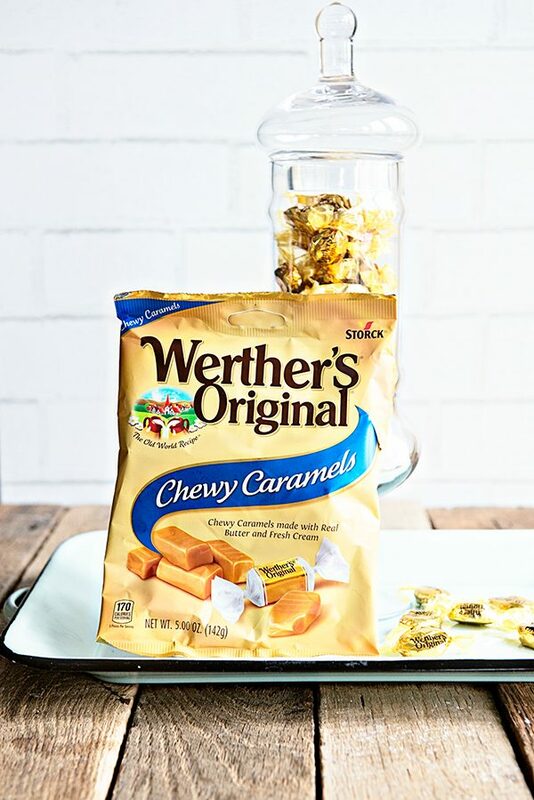 You can now find Werther’s Original at retailers nationwide in several varieties, from hard, chewy, soft and filled caramels, to sugar-free caramels and even caramel popcorn. Make sure to follow Werther’s Original on Facebook and follow the #GreatCaramelDebate hashtag on social media to stay in tune with the results! Disclosure: Although the giveaway is provided by me, this post is a sponsored post written on behalf of Werther’s Original. All opinions expressed are my own. Thanks for reading and supporting the great clients that help make Dine & Dish possible! Beautiful story with your grandpa’. I want to make those same memories with my kiddos (now) and then grandkids (when the time comes). I am a huge Werther’s Original Caramel fan too and we call them Kar-muhl or (caramelos) in Spanish. Thanks for the great giveaway! Crossing my fingers. Kar-muhl girl here. I grew up in & live in Illinois. Heading to Indiana this weekend but not Carmel (Caramel) unfortunately. It’s a super town. It’s kar-muhl and I’m from So. California. I say kara-mel, and I live in northern California. I pronounce Caramel “Kar-muhl” but the truth is, I don’t care how this delicious candy is pronounced–I just want to eat it! I love caramel! I lived in CA for the first 20 years or my life, but have been in Oregon since 1978. I was raised in Michigan and spent most of my aduthood in Missouri. I have lived in Florida for the last 7 years. I have always said Karmuhl. 3 syllables for me – ker-uh-mel – and I’m from Mississippi (not fancy at all). Love me some Werther’s. I think it’s ker-uh-mal… I mean if they didn’t want the third syllable pronounced they would have spelled it carmel not caramel… 🙂 but i have said it both ways. “Kar-muhl” I was raised in Ct. and am from SO. Cal. I had to think about this one but I definitely say kar-uh-muhl. Not sure if it’s the NYer in me that started it or the Florida girl. Love your story about your cute grandpa! I pronounce it Kar-muhl but I am from GA so maybe that is a Southern thing! I’m from Wisconsin, I say Kar-muhl . Kar-muhl all the way! Nebraska born and a proud Kansan now. It’s so cool that your comments close on April 7. That was my brother’s bday and he introduced us to these caramels! Ker-uh-muhl . comes the closest but I actually say the last part differently and say ker-uh-mel . I am in Iowa but spent soome of my childhood in Virginia but everyone I know here says ker-uh-mel so it is likely from here. Werthers is great my Grandmother handed those and lifesavers out at church. She would always unwrap the candies beforehand so we didnt crackle! Neither! I say Ker-uh-mel ? I’m from New Jersey and I say kar-muhl. (I also say cawfee for coffee so ?) My family is from Scotland and it’s kar-muhl there too. Oh geez-I pronounce it both ways….Care-a-mel and Car-mel….depends on my mood I guess? And I live in MA….. I say it like Aimee! I think I go from kar-muhl to car-muhl depending on my mood. I’m a New England girl, but I feel like most people here say ker-uh-muhl. It just doesn’t sound right to me!! Kar-muhl, and I love Werthers! I’m originally from Idaho, but have been a resident of Arizona for the last 27 years. It’s car-muhl unless I’m being fancy! Forgot to add I’m from Michigan, but lived in Virginia for 13 years. I think I go from kar-muhl to car-muhl depending on what I’m making. I’m from Texas, but I here people here say ker-uh-muhl. They are both winners in my book! Both are tasty! Care-ah-melle. And your grandfather must’ve imported the Werther’s that he kept in the pantry straight from Germany since Werther’s wasn’t commonly sold in the US until at least 1997. Oh interesting. It was in the 80’s so I’m not sure. He traveled a ton but I don’t really know how he got them honestly! After reading all of the comments I ‘m not sure which Way I say it!! Both sound delicious to me! But if I must choose, I’ll say Ker-uh-mel. I live in CT and I definitely hear it both ways here. Kar-muhl raised in central Illinois! Kar-muhl and I’m a Kansas girl. 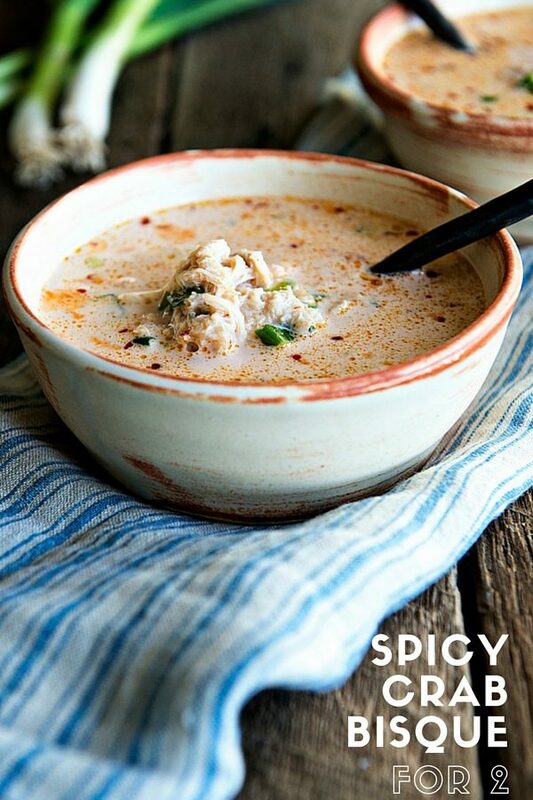 The correct pronunciation is “YUMMY”!!!!!!!!!!!! Coming from Albany, NY area!!!!!!!!! My pronunciation is closest to Ker-uh-muhl. I’m from the South. I’ve always said Kar-muhl, I’m also in the Midwest. Definitely Kar-muhl for me — also from the Midwest! However, I will happy eat them under any pronunciation! My grandfather would always reach for his bag of weather’s when we were on long driving trips and he got lost. They were are traveling treat! I love them and with diabetes they make an awesome sugar free candy. I pronounce it Kar-muhl. I live in Fishers, Indiana (right next to Carmel) and I pronounce it CarAmel. Who has ever heard of a silent?! Well, that’s just what I think. CAR MA L What there’s another way to pronounce it? ker-uh-muhl I am from the South. I have also hear it being called CarAmal when I was llittle and lived in NYC. I pronounced it Ker-uh-muhl, and I’m from the south, in the deep southern part of Georgia. I honestly think that I switch between the two pronunciations! I’ve always said Kar-Muhl. I now live in California, but I am originally from the Pacific Northwest — nowhere near the Midwest! Hi, I live in Belgium and Werthers caramel is welknown here for decades. I loved it when I was young and I still do love it… Werthers caramel was invented by Gustav Nebel in 1909. He lived in Germany, a place called Werther hence the name of this delicious candy. Since Germany is a neighbouring country of Belgium, everybody knows this caramel. Nowadays there are different flavors and also soft caramels but my favorite remains the “classic” one. It’s Kar-muhl in West Texas, that’s just good English! Kar-uh-muhl is how we say it Kansas. I pronounce it Caramel Kar-muhl. I live in Northwestern Wisconsin. I say caramel (ker-uh-mehl) and I’m from NJ and grew up speaking Swedish/English. I am definitely a Kar-muhl kind of girl. They other way sounds too fancy to me. I love Werther’s!! It’s kar-muhl to me. Grew up and still in Minnesota. I pronounce it Kar-Muhl and I live in Lubbock, TX. limitedly a Kar-muhl sort of young lady. They other way sounds excessively favor, making it impossible to me. I cherish Werther’s!! Definitely kar-mul. I grew up in Cleveland, OH but live in Virginia Beach.